Spicers Retreats is a name synonymous with style, quality and relaxed luxury experiences. Every Spicers property is unique in location and design yet all share the Spicers philosophy of providing guests with high quality accommodation and authentic Australian hospitality in relaxed luxury. The newest jewel in the Spicers crown is Balfour Suites, adjacent to its sister property Spicers Balfour Hotel in New Farm, Brisbane. Located in the Indian named and inspired, yet Georgian style, ‘Simla’ building, the boutique hotel has expanded to include eight luxe art deco suites and a function room. ‘Simla’ built c1921 is a two storey Indian inspired building with paired Doric columns flanking the entry and is full of unexpected surprises including a secret room and the sweet Juliet balcony overlooking Balfour Street. The new suites, owned by Jude Turner (Flight Centre Group) and designed by the extremely talented, Rowena Cornwell, Creative Director and founder of Coop Creative, are warm, welcoming, stylish and reflective of the superior standard Spicers is renowned for with a twist of 1940’s art ‘deconess’. Style and elegance of the new Balfour Suites. Each of the eight beautifully appointed suites comprise a private lounge room, separate bedroom, large ensuite which includes a standalone shower and luxurious oversized bathtub, big enough for two. Some suites have their own balcony and some with city views. 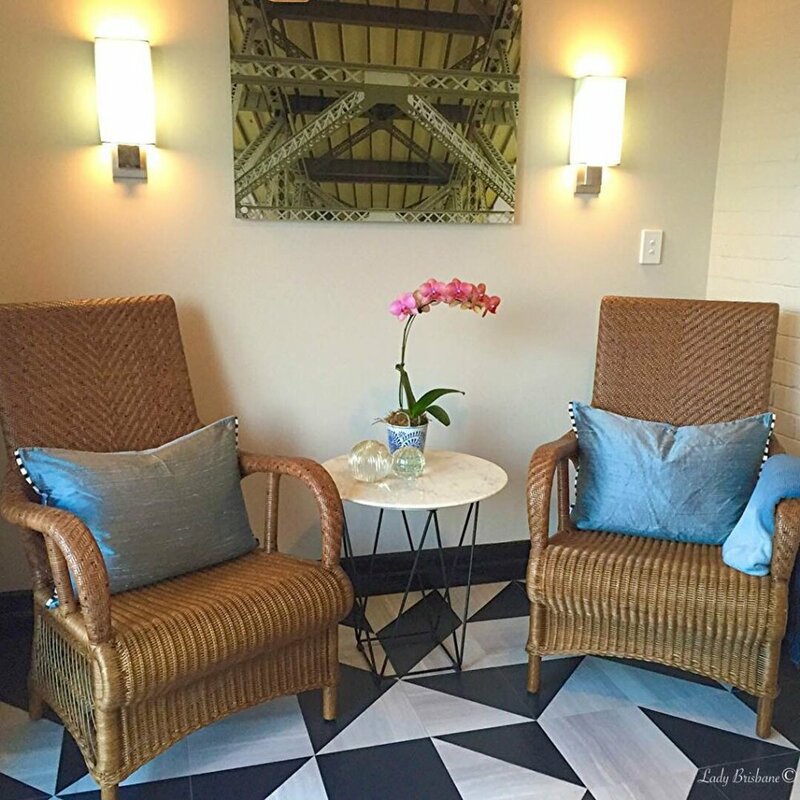 Re-designed checker board floors and cane chairs, typical of the Queensland lifestyle, are featured throughout. Fabulously large artwork by well known photography artist Carl Warner hangs prominently throughout Balfour Suites. His subject matter, the iconic Story Bridge, is a gentle reminder that the Brisbane icon is a stones throw behind the hotel. Art work by Carl Warner. Small framed photographs taken during the restoration feature proudly throughout the building while a beautiful and poignant reminder of the past life of ‘Simla’ are the framed memory boxes, each featuring a different treasure discovered during the restoration. Keep an eye out for the piano keys and the original door bell buttons. In addition to the suites the new contemporary function room can accommodate up to 60 people for cocktail events and 45 people seated. It is the ideal venue for meetings and private functions and provides a intimate, quality, venue alternative to major hotel function rooms. The transformation of Balfour Suites displays an appreciation for history, attention to detail and a love of quality and style. This project of passion to create a beautiful and luxurious retreat from the world has resulted in a boutique hotel of impeccable standards.